Stir Fry is always a big hit in my house. I love it because it is packed full of veggies yet so flavorful that the kids eat them all up without complaint. Actually, I take that back, Spud is slowly convincing himself that mushrooms make him gag because they don’t taste like anything. Except, of course, for the ones he mistakes as chicken and eats without issue. Ummm…ok. Anyhow, I’m not going to stop putting mushrooms in stir fry (or on Spud’s plate) because I just love them in stir fries! This recipe is definitely a keeper! Place the beef in a medium sided bowl. Whisk together the remaining marinade ingredients. Pour the marinade over the beef and stir to coat. Cover and refrigerate for 1 hour. Heat the oils in a large skillet or wok over medium-high heat. Remove the beef from the marinade (reserve marinade for later), cook, working in batches as necessary, until the beef is cooked and browned on all sides. Remove from pan and set aside. Wipe any charred marinade from the skillet. Add more oil, if needed. 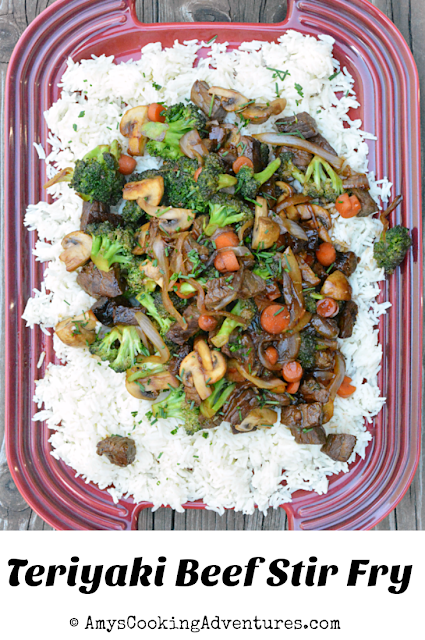 Add the vegetables and stir fry for 5-7 minutes or until crisp-tender. Whisk the cornstarch into ½ cup of the reserved marinade (or use all of the marinade and double the cornstarch for a saucier dish). Pour the marinade over the vegetables and cook until thickened, 1-2 minutes. Stir in the beef and heat through. Serve over rice, topped with fresh chives or green onions. Place the beef in a medium sided bowl. Whisk together the remaining marinade ingredients. Pour the marinade over the beef and stir to coat. Cover and refrigerate for 1 hour.Heat the oils in a large skillet or wok over medium-high heat. Remove the beef from the marinade (reserve marinade for later), cook, working in batches as necessary, until the beef is cooked and browned on all sides. Remove from pan and set aside. Wipe any charred marinade from the skillet. Add more oil, if needed. 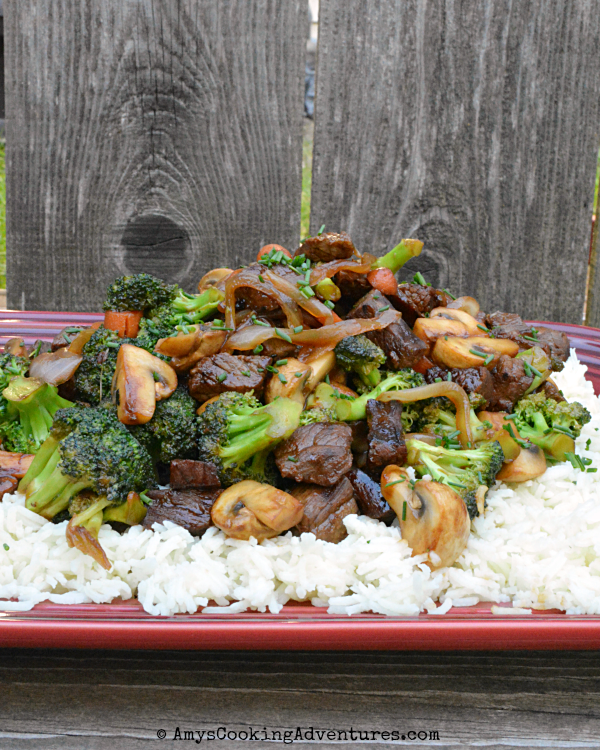 Add the vegetables and stir fry for 5-7 minutes or until crisp-tender. Whisk the cornstarch into ½ cup of the reserved marinade (or use all of the marinade and double the cornstarch for a saucier dish). Pour the marinade over the vegetables and cook until thickened, 1-2 minutes. 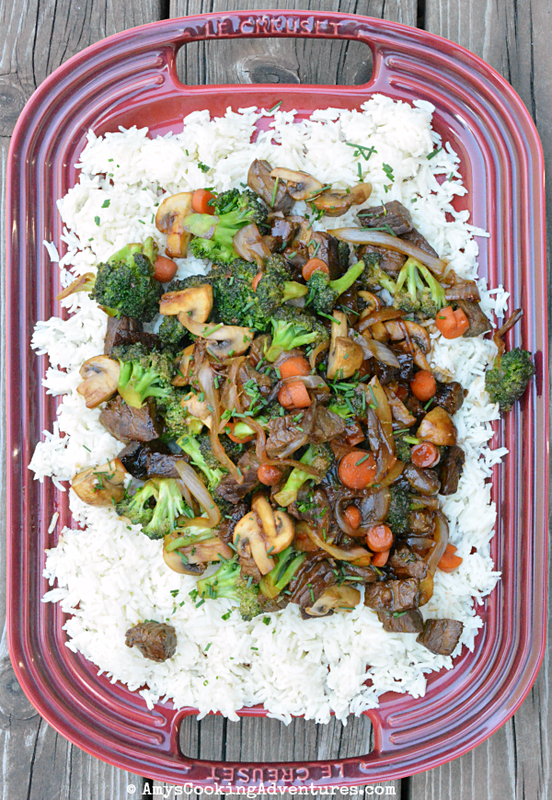 Stir in the beef and heat through.Serve over rice, topped with fresh chives or green onions.